The title of this film says it all. Well, nearly. How can eight short words really sum up all the ingenious parts of Pedro Almodovar’s ecstatically crazed vision? In this brightly colourful film, the Spanish maestro spins his cinematic magic around a wired television star who’s recently been dumped by her lover. Already reduced to selling washing powder in her soap character as the mother of some blood soaked murderer, Pepa Marcos does not handle rejection one little bit. Even with the help of a home made gazpacho laced with dozens of sleeping pills, her obsession knows no bounds. And when her model friend barges in seeking refuge from the police after harbouring Shiite terrorists, things only get kookier. Almodovar’s long-time muse Carmen Maura is sensational as the pill-popping Pepa, tenderly watering the plants on her penthouse balcony before exploding in a demented rage and hurling the telephone through the window. Soon to be seen in the writer/director’s latest film Volver alongside Penelope Cruz, Maura shows us all the facets of a woman truly possessed. In one wonderful scene, she’s seen dubbing the voice of Joan Crawford in Johnny Guitar, while the voice of her former lover is piped in through her headphones reading Sterling Hayden’s part. The melodrama is way too close to the bone for Pepa and she feints with the exertion of it all. It’s clear where she gets her behavioural patterns from. Throw in a stuttering Antonio Banderas as her ex lover’s son and Julietta Serrano as his psychologically deranged mother and the whole thing hurtles towards total madness. 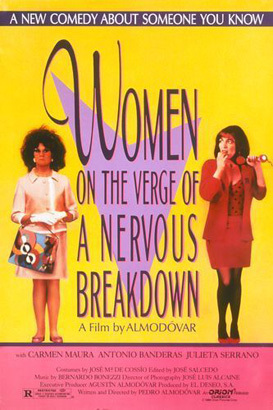 For anyone who’s ever felt a little freaked out by love, life and the whole shebang, Women on the Verge of a Nervous Breakdown is like wonderfully soothing balm for the soul. Or at the very least, a regaling romp through the many hues of the emotional spectrum.